Team USA is playing some great hockey right now in the 2014 Winter Olympics. A lot of their systems look just like the stuff we’ve laid out in the Coaches’ Training Course, especially their offensive attack structure. 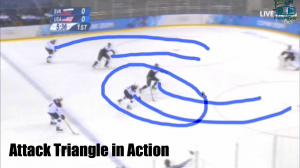 In this play you see a textbook Attack Triangle, with F1 driving wide, and pulling the opposing defenseman deep; F2 driving wide to the far post, pulling his defenseman deep, and F3 filling in the vacated space in the high slot. From there, it’s a drop pass, and a one-time snipe. Beautiful setup, beautiful goal!